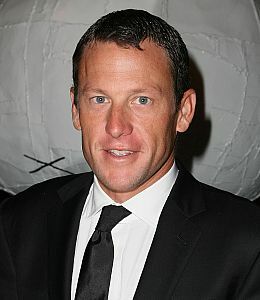 Cyclist Lance Armstrong has confirmed that he and girlfriend Anna Hansen are expecting their first child together. "Anna and I are thrilled to confirm that we are expecting in June and our families are ecstatic and grateful," Armstrong told Us Weekly, via his rep. "We are very much looking forward to what 2009 brings on many fronts. We appreciate [the public] respecting our privacy, as we are both eager to celebrate the holidays as a family." Perez Hilton first reported the news on Tuesday -- and revealed that Anna and Lance have been dating since July. "They met through Lance's charity work. Anna works at a non-profit for cancer survivors," Perez reports. The Tour de France winner has three kids with ex-wife Kristin Richards -- Luke, 9, Isabelle, 11, and Grace, 11. Armstrong survived testicular cancer, and had his sperm frozen in the 1990s. Lance's three kids were conceived through in vitro, but according to Perez, this child was unplanned. Sperm reactivation is rare in testicular cancer survivors.